The thesis is an exploration of George Herbert's Country Parson within its ecclesiastical and political context. Specialization: 17th century English Church History/George Herbert/Reformed Spirituality. 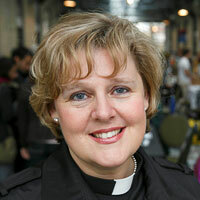 Canon Missioner, The Diocese of Toronto, August 2013 – present. Chaplain, Havergal College, August 2007 – 2017. Question #1 - What core principle(s) (max 3) guide your ministry and leadership style? I have one strong core principle of leadership: to listen and watch for where God is at work in the church and the world and to join in. All other elements of my leadership style flow from this core principle. As a spiritual discipline, I try to constantly listen – in prayer, through scripture, in the church and through culture - to discern God’s will in order to formulate direction and delineate a compelling vision. I enjoy casting that vision with imagination and energy. But leadership is more than vision, it’s working a plan with a critical path and achievable deliverables, so I’m also a strategic leader. I really enjoy bringing people and resources together to work toward a common goal. I have a genuine investment in all people as bearing the image of Christ and my relational and bridge-building skills are a keynote of my style. I am a natural team builder; I work with the people God has given me to use their skillsets in order to align vision and action. Question #2 - What do you think are the three most significant challenges facing the Diocese of Niagara over the next 5 years, and what is your vision for how we might respond? To intentionally invest in Christian Nurture and Catechesis for spiritual renewal, confidence and energy for mission and its outworking: social justice. To form, based on evidence, a sustainable and strategic plan for resourcing growth in parishes. To leverage the diocese’s many property assets to position ourselves for future growth and when opportunities are identified, to plan for church plants and/or amalgamations. Question #3 - Identify 2 significant leadership roles you have played in your diocese. In each case, what was your role, what did you learn, and what was the outcome? In this role, I act as a catalyst and enabler of missional ministry in the Diocese of Toronto. I am a vision advocate, coach and mentor for existing church plants and pioneers and for short and medium term missions. I plan strategically for new churches and support extra-parochial ministries such as Chaplains. In addition, I fulfill a number of roles as Missioner throughout the Diocesan structure. These experiences have demonstrated to me the pressing need for Christians to understand, engage and respond to our secular culture from preparation for ministry to shaping ecclesial structures for mission, and in praxis through parish and extra-parochial ministries. My role was to engage with students, staff, faculty and alumnae in the school community through prayer, pastoral care and sacrament; to provide contextual discipleship programming; to create and implement the vision of a Chaplaincy department; to oversee and encourage theological students and Assistant Curates ministering in the school context. My experiences over those ten years were very valuable. I learned how to minister within a culture that is inoculated against faith and yet which expresses a deep spiritual longing; I learned to listen deeply and to respond as the Holy Spirit prompted in ways that made sense in that community and this resulted in the growth of the Chaplaincy Department and budget; in the renewal of the Religious Education curriculum and in strengthening the practice of daily Prayer throughout the school. Question #4 - Identify a role you have played or a significant way you have been involved in the national Church and/or the worldwide Anglican Communion. What did you learn from this experience? My National Responsibilities include: acting as Anglican representative for the National Ecumenical Dialogue between the Anglican Church of Canada and the United Church of Canada. I co-led the Inter-Diocesan Learning Community for Mission in the Diocese of Toronto which included 5 other Canadian Dioceses and I was a member of General Synod in 2016. I am a member of the Board of Threshold Ministries and the current National Team Leader for Fresh Expressions Canada. Internationally, I represented the Diocese of Toronto throughout the Inter-Diocesan Learning community process in Liverpool, England from 2013-2016. This past September, for the second time, I was part of the International Fresh Expressions Learning Community in the UK. I have learned that we share commonalities in the challenges of secularism and in the opportunities for reconnecting with our culture across Canada and with the international Body of Christ – and that national and international ministry partnerships are valuable learning tools for our future.